Antelope is a term referrin tae mony even-toed ungulate species indigenous tae various regions in Africae an Eurasie. Antelopes comprise a miscellaneous group within the faimily Bovidae, encompassin those Auld Warld species that are neither cattle, sheep, buffalo, bison, nor goats. 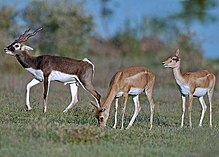 A group o antelope is cried a herd. This page wis last eeditit on 24 Dizember 2013, at 01:44.